All current options for GXP bearing replacement require compromises in bearing choice and fit. Shockcraft instead offers its own GXP compatible bottom bracket which has no compromise on bearing fit, performance or material options. 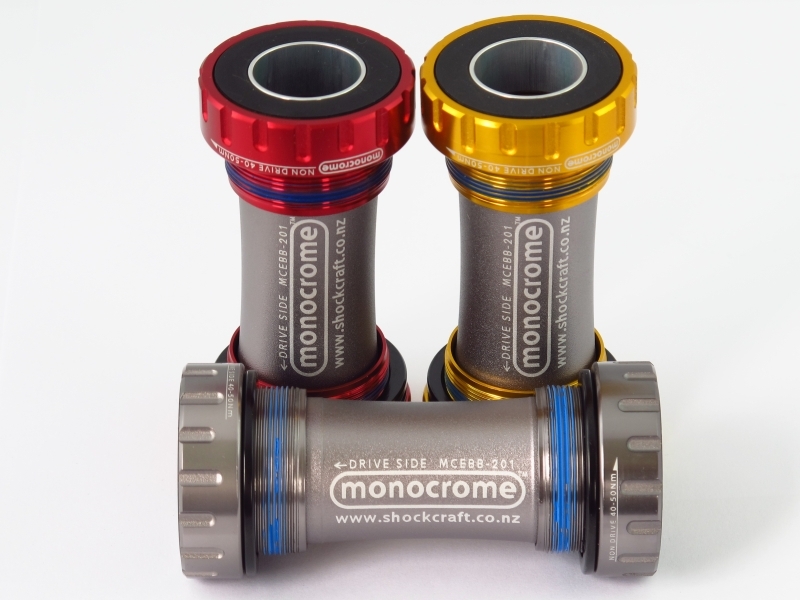 Shockcraft's Monocrome Stepped Bottom Bracket is a direct replacement which fits perfectly and is 100% servicable. Bearing options both when new and for retrofit include Chromium Steel, Stainless Steel, Ceramic Hybrid and the Big Steel or Big Ceramic Hybrid options. They use exactly the same bearings and caps (or gaskets) as our 24 mm MCEBB-001 bottom brackets but step down to 22 mm on the non-drive side and have a width and offset tailored to fit the GXP cranksets. For wet conditions we recommend CNC Storm Drains. If paired with Monocrome Stainless Steel bearings the bearings are warrantied for 12 months in any conditions. Once you have a Monocrome Bottom Bracket it will last the life of your bike. Replacing wear parts (bearings and caps) is easy, cost effective and allows upgrades at any time. Bearings listed below are replacements for the Monocrome Stepped Bottom Brackets. Replacement "Top Hat" bearing cover pair for your Monocrome External Bottom Bracket. These can also be used to fit 6805 bearings into Trek BB90 and BB95 internal bottom brackets. This allows greater bearing choice. Fits BSA external MCEBB001, MCEBB101 and MCEBB201. This version is standard fit and may be loose or knock on worn crank spindles. It fits best with new cranks. This version is tighter fit to remove any play or knock on worn crank spindles. It will be tight to install with new cranks.